First off I want to say that when I made this, I didn’t know how amazing they were going to be. I knew they’d be great, I just didn’t know how great. 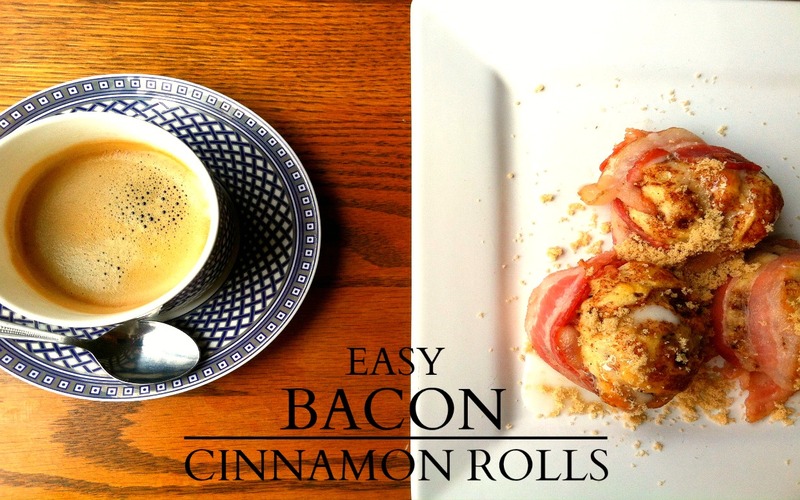 Now when I see recipes like this, I usually see bacon wrapped inside of the cinnamon rolls, and that was going to be my initial way of making them. But I thought I’d try something a little different and wrap them in candied bacon instead. The result: Soft cinnamon goodness surrounded by popping bacon grease. The rolls soaked in the juices and made for a mouthwatering flavor. The only things you need are bacon, brown sugar, and pre-made cinnamon rolls (which come with its own icing). That last part is optional, but what could taste better than bacon and brown sugar? And it goes great with a cup of espresso. Preheat oven up to 400 degrees. Cook bacon on medium heat for 2 minutes and then top with brown sugar. Lower heat, flip bacon, and top with another layer of brown sugar. Open up the container and take out each individual roll and wrap a candied bacon strip all around the side of it. Place the rolls 1-2 inches apart (for faster cooking) in a glass baking dish or a metal sheet. No need to grease the pans as the bacon will do that for you. Take out with mild caution. The bacon grease will be slightly popping. I haven’t had it get on me or fly out for that matter, but it is something to be aware of when taking it out of the oven slowly. Place on cool plate while heating up icing in microwave for 15-20 seconds. Then drizzle the icing over the rolls and sprinkle some brown sugar over top. Enjoy this crazy foodie goodness.